I speak with my customers and colleagues about this very topic, so I thought it was about time I wrote a post on how to power down a Virtual SAN cluster the correct way after all there may be countless reasons why you need to do this, from Scheduled Power Outages to Essential Building Maintenance.? 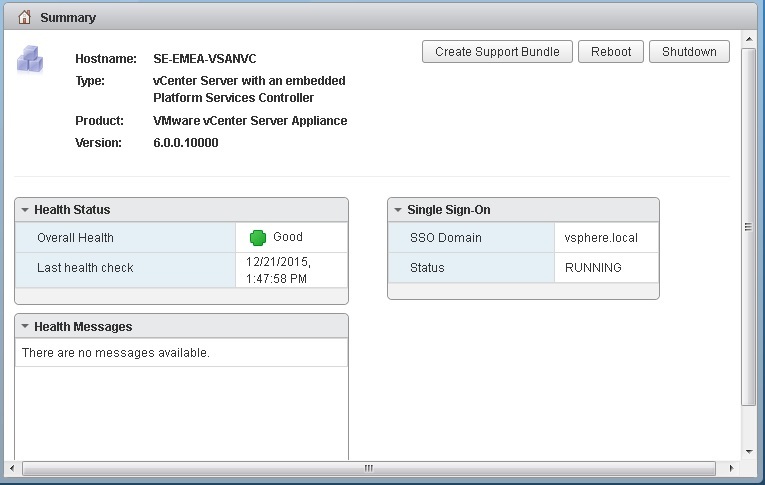 There are a number of factors that have to be taken into account one major factor is when your Virtual Center server is actually running on the Virtual SAN cluster you wish to power down, in order to write this blog post I performed the actions on an 8-Node All-Flash cluster where the Virtual Center Appliance is also running within the Virtual SAN environment. The above command will place the host into maintenance mode and specifying “Do Nothing” as the response to the migration or ensuring that data will be accessible in the VSAN cluster, the reason behind this is that your virtual machines are powered off now anyway. One of the other options and I would highly recommend this option is the VMware Host Client, this is basically a vib you install on each of your hosts, and then you point your web browser to the IP address or FQDN with a “/ui” at the end, this will bring you to a host based web client that is fantastic to use for managing an ESXi host outside of vCenter, from within this client you can place the host into maintenance mode from the Actions tab, and also shut the host down from the same tab. Since there are no running virtual machines, and the way Virtual SAN stores the disk objects there is no risk to data by doing either option, after all some power outages are unscheduled and Virtual SAN recovers from those seamlessly. 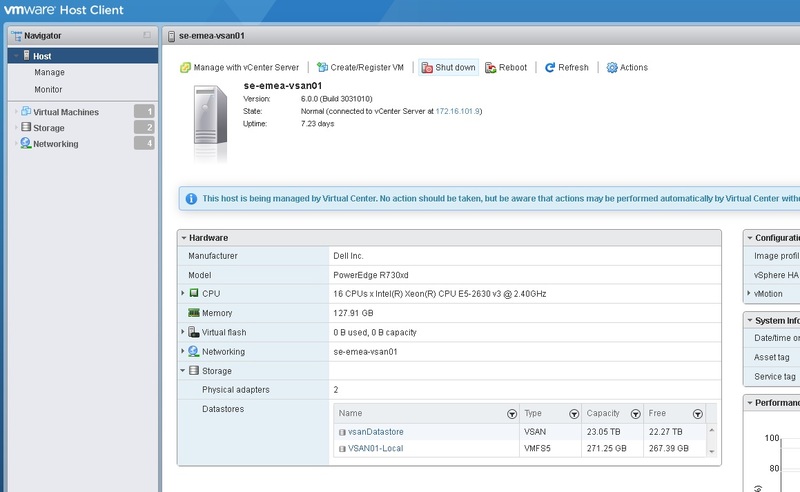 Just a quick note, during the powering on of the ESXi hosts, Virtual SAN will check all the data objects, so whilst these checks are performed some objects or VMs may report as inaccessible from the vCenter UI, once Virtual SAN has performed its checks, the VMs will be readily available again.